MusicHub is the best theme for music, club, party, radio station, bands, events, or blogging. The theme have a modern design and is very flexible allowing your to customize all you want. Visual Composer: Theme based on modern Visual Composer with drag and drop interface, so you don't have to touch a single line of code to add different elements. Slider Revolution: Create animations and responsive slides with the amazing revolution slider. Show off your content in a great style. All PSD Files Included: Creating a quick mockup for a new page is easy due to the 16 PSD included. Create pages, chose images, play with the fonts until you get the look you want. WPML Ready: Support for multilingual websites with WordPress, making it easy to translate pages, posts, tags and categories. WPML makes it easy to build multilingual sites and run theme. Version HTML Included: You can get free HTML version if you buy WordPress version. After you purchase you find files in the download archive. Responsive Design: Whether you viewing the website on a big or small screen, laptop, tablet or phone it will always look great. Just put your info and pearl will take care of the rest. Fast Support: If you still have questions or have problem with customization or others, open ticket on our support center and we will answer you for help. 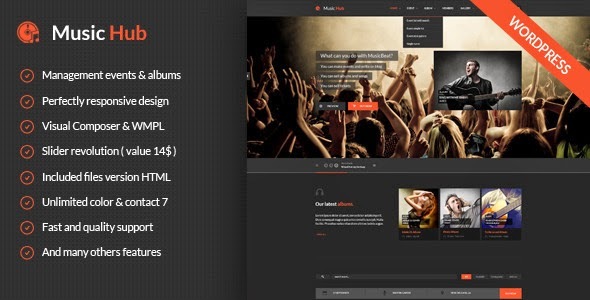 Item Reviewed: MusicHub Music Band Club Party WordPress Theme 9 out of 10 based on 10 ratings. 9 user reviews.